August, the month of summer vacations and relaxation. We here at Chez 107 will have some vacation time soon, but for now I’m still in the throes of long work hours and business travel and failing to keep up with the housework. Summer has not particularly brought leisure, though it has brought humidity. And this evening it brought a crazy thunderstorm, which has tempered the heat only a little. With my heavy travel and work schedule I’ve been neglecting the kitchen, even as I’ve added some toys to it. We replaced our skillets, which were chewed-up nonstick — not an especially safe arrangement, but now we have Calphalon. Also nonstick; I must have misread the product description, but we can be more gingerly with them than we were with the old ones, since we didn’t buy them with grocery receipts. We bought a a SodaStream, which we adore. Last week I hauled home a new kitchen garbage can, a robust (and kind of expensive) one with a foot pedal, which so far is performing wonderfully. But cooking? I have been a bit lazy. 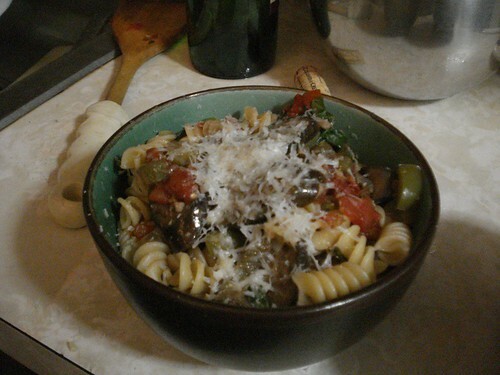 I did a little baking in June and July, and have made a few pasta dishes. Still, we’ve had more than our fair share of delivery. This weekend I did better. 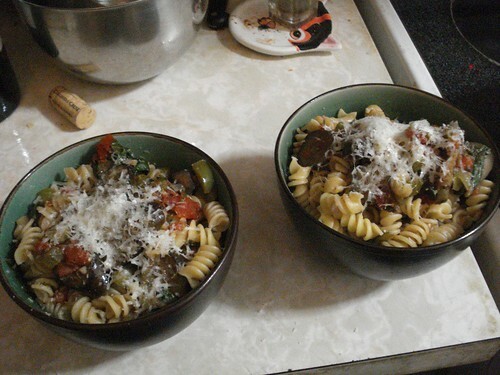 I cooked dinner both last night and tonight. 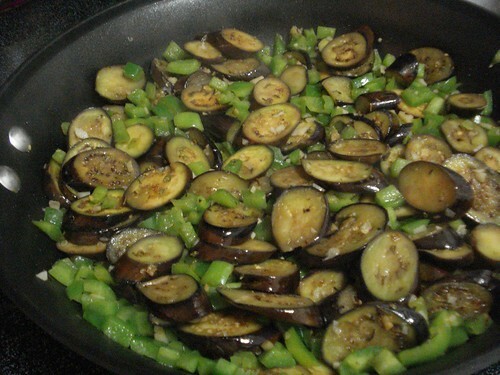 Given how hot it’s been I feel like I deserve a freakin’ medal for standing in front of the stove, even if only long enough to saute vegetables and cook pasta. 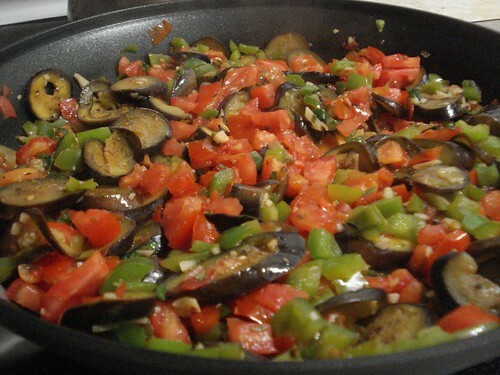 Tonight’s dish was improvised, using vegetables I’d gotten at the Greenmarket without a very definite plan for how to use them. 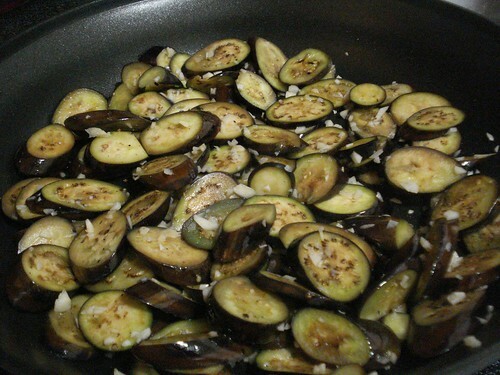 I sliced and salted some baby eggplant, then rinsed away the salt and blotted them dry. 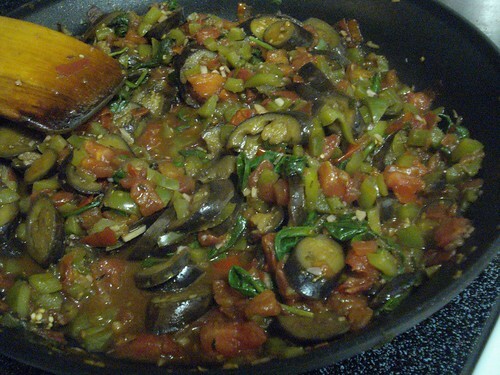 I threw them into a skillet (one of the new ones) with some olive oil and let them cook a bit, then gradually added garlic; green peppers; a few pinches of oregano, paprika and thyme; about two tablespoons’ worth of basil chiffonade; some chopped tomatoes; about 3/4 cup of red wine; and some baby spinach. 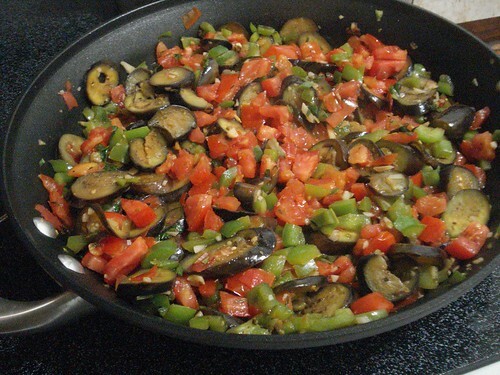 I kept cooking and stirring around until the eggplant was breaking down nicely and everything seemed to be blending together well. 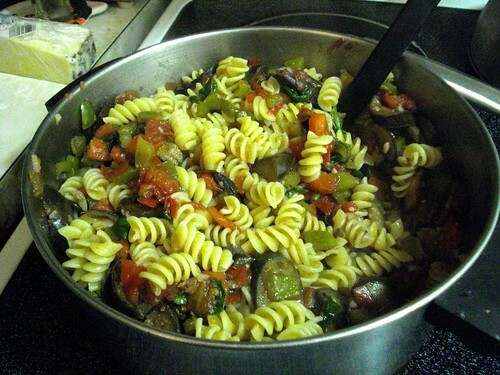 In the meantime I cooked a pound of dried rotini, then drained it and tossed the pasta together with the vegetables in the pot, adding a little bit of the pasta water to help the consistency. I dished it up and grated on some Romano. The mixture was delicious. 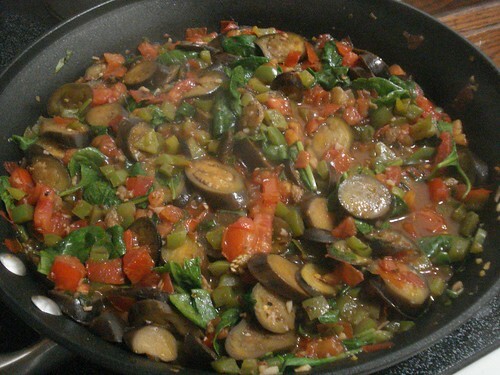 The flavor of the vegetables blended wonderfully, and the wine gave a nice tone without overwhelming the other ingredients. Best of all? Leftovers. This is going to be really good cold.